Most decent calipers are accurate to within +/-0.001" (0.02 mm), which is enough to make sure you don’t cut too deep when milling and to know that your design will fit within the piece of material you’re using. 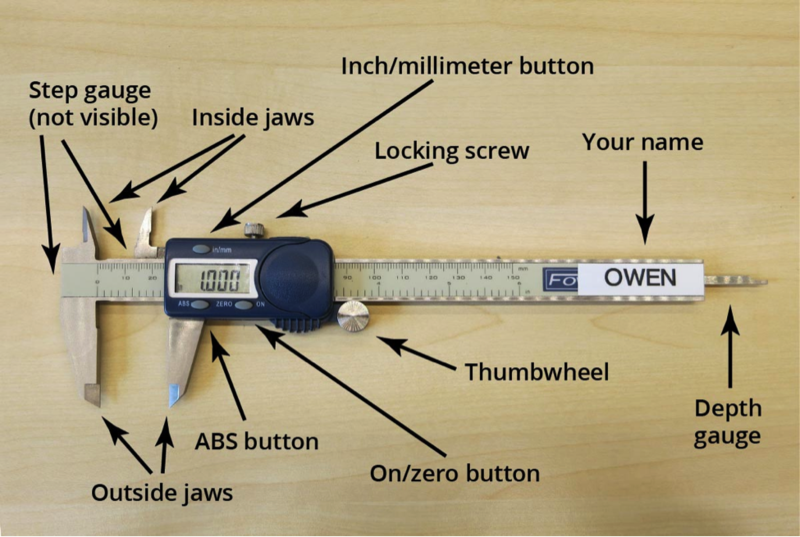 This guide demonstrates how to use digital calipers to take various measurements and is useful for anyone wanting to learn how to use them properly. In a word, accuracy. A ruler and your eyeball might be fine for many scenarios but not when it comes to making sure your machine mills at a depth of 0.003" and not 0.006" or 0.001". For instance, if the material thickness (Z-axis) measurement is higher than expected, then on the first cutting pass, the end mill will encounter more material than expected, which can dull or break the end mill. Alternately, if the material thickness (Z-axis) measurement is lower than expected, then the milling machine's cuts will not go deep enough. It’s critical to zero your calipers before taking any measurements. If you skip this step, your subsequent measurements may not be accurate. In the animation above, the display reads -0.0025" when the jaws are first closed (inaccurate). The zero/on button is then pressed to set it to zero. The next time it’s closed, it reads 0.000", so it’s ready to take measurements. Some fancy calipers, like these ones, guarantee that the zero position will always be correct, but it’s still important to make sure.